Family Rush, Dragon Lee, Dragon Lee II (sons), Pit Bull I, Pit Bull II, Franco Colombo (brothers), Latino (nephew)unrelated to Pierroth or Pierroth Jr. Birth date, location 1968 or 1969, Tala, Jalisco. Muscular luchador of the 90s. Biggest run was in the early 00s, first as part of Pierroth Jr.'s Boricua faction under the name Poder Boricua, then against the group as Poder Mexica. Never a big success, and his greatest push didn't come until late in his career. Actually became more famous a decade after the peak of his career, when his sons Rush and Mistico were pushed as top stars in CMLL and their luchador father was routinely mentioned. 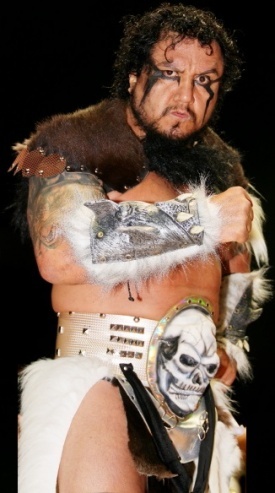 His sometimes strained relationship with (then) Dragon Lee was one of the main plotlines of El Luchador (season 2), and he made a brief appearance advising his son on En Busca de un Idolo (season 1). He was reintroduced in May 2013 as Comandante Pierroth, carrying on the name of the previous character. There has been no acknowledgement of his previous characters, but the visible tattoos match Munoz. He is partnered with La Comandante, Pequeno Violencia & Pierrothito as Comando Caribeno. Within months he quietly became just Pierroth. In 2014 he introduced Misterioso Jr. and Sagrado as his partners in a new Comando Caribeno. By 2016 it was revealed that Rush was his son & he would be joining him in Los Ingobernables.